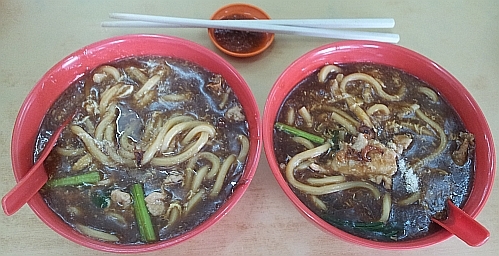 This time I returned to Paramount Garden Coffee shop, PJ and ordered two bowls of Lor/Loh Mee (around MYR6.50 for a bowl) for lunch. I kept one bowl and a bit more from my bowl of noodle in my trusted container for my spouse to try in the evening. It still tasted very good when I ate some for dinner that day. Oh, it did not turn salty? I kept noodles before and after some time, it absorbed all the gravy and turned very salty so I do not do that anymore. the gravy is not salty wor and the amazing thing is this thick lor mee is not those absorbing type of noodles so did not absorb any gravy. mee too but can't eat much. We can't do that here. Our not-so-yellow noodles will absorb all the gravy and swell up...and turn soft and soggy, not nice anymore. I would order - ask the people to put everything in the container but pack the noodles, cooked and drained dry, separately. Come dinner time, I would heat up the gravy, put in the noodles and serve. your way is better but I too lazy to heat up the gravy later so all put together. Wow, i this is pretty cheap for me! 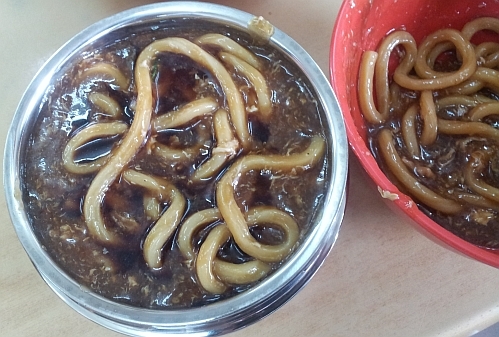 This also reminds me of the pata tim of Chinese delicacy. i wonder what you ate when you visited this country. Not a fan of lor mee. The sweetness. The spice. Wouldnt the dish turn starchy at the end of the day?? this gravy is not sweet. did not turn more starchy maybe because I added lots of vinegar into the gravy. Also have the same concern about the noodles turning soggy! You're so economical to feed, hehe. a bit softer but not soggy. I love lor mee but not easy to find tasty ones here. Have a fabulous new week! thanks. this one is tasty! i was with about 6 of my co workers. i told them that i ordered for my spouse to try at home. wahhh..very smart.. yeah, sometimes rather than wasting, might as well bring a container to take back.. Good idea! yes my container goes every where with me. This looks sooo good. I have been a Lor Mee fan since my Penang days. I could eat them for supper every night when I was a student. Nowadays I have become so conscious on my diet. share a bowl with your friend should be ok for your diet.